In Classical Conversations, we often speak of the wonderful fruit of restoring the education of two generations of students—the education of the students who are in Classical Conversations and also the education of their parents. What does this mean? If we want our children to receive a thoroughly classical, Christian education, it means that we must be willing to pursue a new education for ourselves. We must be willing to tackle some new subjects and ideas that we never learned, and we must be willing to re-learn some that we encountered in school. In this article, I want to draw your attention to the last two. However, I do not wish to completely ignore the first, so my top two recommendations are: A Mother’s Heart by Jean Fleming (my apologies to the dads) and Shepherding a Child’s Heart by Tedd Tripp. When my son was born, I received a book on classical home education from a friend. I read it cover to cover, including the specific discussions of texts to use in high school. I was immediately relieved that I had so many years to unpack this important idea and do more research. There are currently a number of books on classical education, so where should one begin? If you are new to classical education, hopefully you have attended a Classical Conversations Parent Practicum. At this event, you were exposed to the differences between a modern education, a poor Christian education, and a classical, Christian education. You may have grasped the new and exciting ideas only to go home and struggle to remember the details of these ideas or to share them with a friend or family member. If this describes your experience, begin your reading about classical, Christian education with Classical Christian Education Made Approachable. Then, read Leigh Bortins’ Trivium Trilogy, which explains how we implement classical, Christian education in the Foundations, Essentials, and Challenge programs. Like any other subject you will study, classical education has many layers. After you gain a basic understanding of the method and model of classical education through the aforementioned books, it is time to explore the mission and vision of classical education. My favorite book for articulating the vision is Norms & Nobility: A Treatise on Education. Here, David Hicks articulates the big picture of training children to seek and to love truth, goodness, and beauty. Further, in light of our students’ understanding and wisdom, he discusses how we must give our students a deep sense of responsibility to others. Students can be inspired to live virtuously. Norms & Nobility is a beautiful and worthy read; however, it is also a difficult read. Because of this, I recommend that you commit to read it with a small group of your friends. Keep one another accountable to read and digest just a chapter at a time. (Even the prologue is meaty.) Meet for coffee and wrestle down some new ideas. I have been so grateful for a second chance at my own education. When my firstborn was an infant, I supplemented our income by tutoring geometry. This time, I progressed beyond being able to set up the problems and solve them to truly understanding geometric theorems and proofs. I experienced a similar revelation in chemistry while preparing to tutor Challenge III. Every year, I commit to studying a subject (or sometimes two) in depth. A couple of years ago, I decided to tackle Latin. Suddenly, my children had grown older, and I was preparing to tutor Challenge II, which meant tutoring students through Henle II. Oops! I had not been through Henle I yet. So, I committed my summer to going back to school, particularly in Latin. Each day, I copied vocabulary words into my notebook. The next day, I copied them on flashcards. The day after that, I quizzed myself and set aside the words I missed to practice on the next day. After my vocabulary practice, I completed as many exercises as I could in one or two hours. Then I grabbed the answer key, checked my work, and corrected it in a different color. I did not make it all the way through the text in the summer as I had hoped, but I made it quite far considering the three months I had to work with. Since then, a local homeschool mom who loves Latin has begun offering six-week summer Henle I intensives in our area. I wish I had had a group to study with, so be sure to consider finding a mentor for yourself or at least a committed study buddy. In addition, Classical Conversations has since uploaded many Latin resources for parents to the CC Connected Challenge tier. Each of you will have a different need based on your own educational background and the needs of your children. If your children are small, read through the Challenge literature, starting with Challenge A literature and moving ahead. Not only is this an enjoyable project but it will also prepare you for great discussions with your children down the road. Read some of these aloud to your small ones or meet for coffee to discuss with friends, or both. The year before my second child entered Challenge A, the moms read through the Challenge literature at the pace of one book a month and gathered to produce and sort ANI charts, so we read through the literature and practiced using The Lost Tools of Writing. If you are entering Essentials, work through Our Mother Tongue while the kids are swimming. I did this the first year we offered Essentials in Oklahoma, and it proved invaluable. If your kids are struggling in math, use the Teaching Tapes to learn Saxon 8/7 or Algebra 1. Start a community library for expensive resources so that you can share the cost. If you are not ready to tackle a specific subject area, form a local book club to learn more about classical, Christian education. 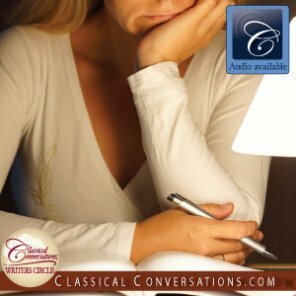 Classical Conversations has created free, downloadable book club guides for The Core and The Question. Get together in homes or at the coffee shop to learn how to tackle specific subjects with your family. I am a morning person, so I like to rise before the children to read Scripture, pray, and study. Many of my friends prefer to study during afternoon naps or after their children’s bedtime. Aim for one hour a day at first. I believe you will be amazed by what you can accomplish in one uninterrupted hour. Maintain your spiritual and intellectual growth! Burn with a gemlike flame! Infect your children and students with curiosity!